Solar-dyed, using a handful of soursob (Oxalis pes-caprea) flowers in a jar and adding boiling water and a skein of unmordanted cotton yarn. Left for 7 days on back deck in weak, late-winter sun. I was very surprised how much colour the yarn took up, given that no mordant was used; it is much brighter than in the photo but I couldn’t capture the colour. Need to test for light-fastness. 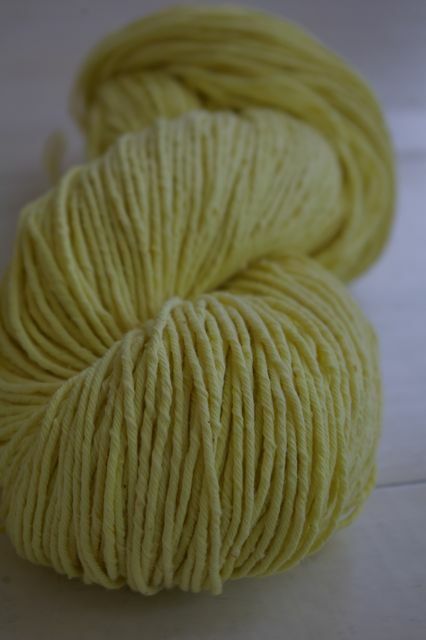 This entry was posted in dyeing, knitting and yarn, plants and tagged dyeing with soursob on October 21, 2012 by admin. Lovely, I’ve heard that soursob is a mordant, haven’t tried it myself, I should experiment while the garden is covered in it. I *need* some soursob! (Which I had never heard of before by the way). I’m all for chemical free dyeing and on cotton, yowzers!